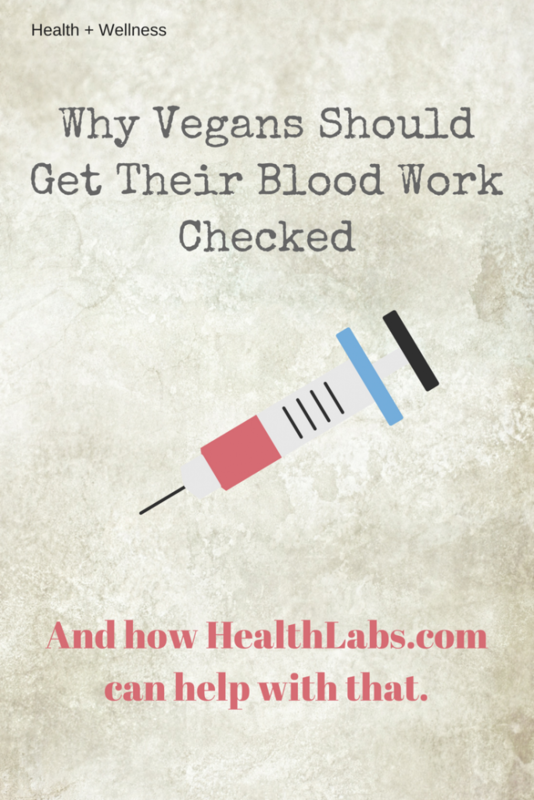 Why Vegans Should Get Their Blood Work Checked And a Review of HealthLabs. Today we're talking about something a little different on Sprouting Zen. Here you won't find a recipe, but rather some valuable information regarding your health and wellness – which as you already know by now – we are extremely passionate about at Sprouting Zen. This post was made in partnership with HealthLabs.com, but as always all expressed written opinions are my own. Let's talk about blood work, and why as a vegan (and even as not-a-vegan), it is important that you get your blood work done at the very least once a year, especiallyyyy in your first year of eating a plant based vegan diet. When you get your blood work done, your blood is analyzed for nutrient deficiencies, vitamin and mineral deficiencies, and a bunch of other stuff that can help diagnose any problems, issues, or underlying conditions that may be present at the time (depending on the test). Blood work may also check your cholesterol levels, blood sugar levels, and your overall well being. So, why is it important to get your blood checked as a vegan? For starters, when you go vegan you are making a really big change in your diet. You will be eliminating foods that your body is totally accustomed to, and most likely adding new unfamiliar foods to your diet as well. Your body is going to go through a drastic change the first few months of being vegan. Having your blood work done before, and within a year of being vegan allows you to not only see a positive difference in your results (for example – many people say that their cholesterol levels decrease on a vegan diet which is super cool to be able to track), but it also let's you be aware if what you are doing is right for YOU. You'll be able to catch any nutrient, vitamin or mineral deficiencies early on – a common deficiency in veganism is Vitamin b12 deficiency, because when you eliminate meat and dairy you no longer have a direct source of this vitamin in your food. Having your blood work done allows you to rest assured that what you are doing is working for YOUR body and your well being. And if something is a little out of whack, or not within normal limits, this allows you to redirect your diet and fix the issue before too much time passes by. For those unfamiliar with blood work testing – the way it usually works is: you have to find a doctor, schedule an appointment, ask for the blood work order, then schedule an appointment with a nearby lab testing center, and finally get your blood tested. Phew. And let's not even talk about dealing with your insurance. If you're anything like me – this whole process is usually very tedious and time consuming, which means more times than not, I am canceling the appointment, or not scheduling it AT ALL. I totally skipped my blood work last year, and it wasn't because I forgot, I was just so busy and didn't want to go through the entire process I mentioned above. Next thing I knew – 2017 was over, and I didn't get my blood work done for the year. Who else can relate? That is why when Health Labs contacted me a few weeks ago, and told me all about their online lab testing services, more specifically, they mentioned they had a test that was tailored for vegans called Vegan Nutritional Maintenance Panel Test, I was really intrigued and had to give their services a try. It was also going to be almost 2 years (yikes) since my last testing, and I really wanted to know how my nutritional profile was doing – so when Health labs offered to pay for my vegan testing in return for an honest review of my experience – I said, why not! So, what is Health Labs? In 2018 when almost anything is available online, it should come as no surprise that you can now order blood work online as well. It may seem a little strange to you at first, if you are like me and totally accustomed to having to visit a doctor's office for your blood work, but I'm telling you this is the real deal – and I tried it myself to prove it. HealthLabs.com has been offering affordable lab testing online since 2015. They make the process totally convenient, affordable, fast, and with very little hassle from your part as a customer. No need to deal with insurance deductibles, or waste an entire day sitting in a doctor's office waiting room just to get the order for your blood work. HealthLabs.com offers a wide variety of tests, but the one I tried and am specifically talking about in this article, is their Vegan Nutritional Maintenance Panel test. It is tailored for those who have been vegan for a while now (at least 8 weeks) and just want to get a feel for how their nutrients and vitamin levels are doing after such a change in lifestyle. *For those who are not vegan yet, but are wondering if they should go vegan based on how your blood work is doing - you can check out this test. Get your results online within 24 to 72 hours. No need to deal with your insurance, and no referral needed which means you don't have to visit your doctor first before getting your blood work done. No hidden fees. Once you pay for the lab test, that's all your going to pay. I kept waiting for someone at the lab center to ask me for payment, but they never did. Everything went very smoothly. Approved CLIA-certified labs including well known lab centers such as Quest Diagnostics and Lab Quest. Fast Results – Because everything is online, you'll receive your results within 24-72 hours via your email! Follows HIPPA Privacy Laws and Rules – so your information is private and secure. It's the law! In general HealthLabs.com is a very beneficial service for anyone looking to get their blood work done in a fast and convenient way. I want to make a point in saying that I still believe it is imperative to visit your primary care provider on a yearly basis – especially when making a big change in your diet. But if you are overall healthy, and don't have any major medical underlying conditions, and you just want to see where your nutritional levels are at because... maybe you just went vegan a few months ago, or are thinking about going vegan (check this test out if you're not vegan yet, but you're thinking about going vegan), and you just want to see where your base line is and how your wellness is doing – then HealthLabs.com's vegan nutritional panel is a great place to start. Once you have your results – if everything is within normal limits then you can relax knowing that your body is adjusting well to your vegan diet and you can continue doing what you are doing. On the other hand, if the results show that something is not quite right, or not within normal parameters – then you can adjust your diet, address any deficiencies and make that doctor's appointment with your lab results already on hand and ready to go for your doctor to analyze your results with you. My experience using an online lab testing retailer for the first time - HealthLabs.com, was a positive one. The process was just as easy and fast as they promised it would be. And I can say with certainty that if it wasn't for Health Labs, I probably still would not have my blood tested this year, and I wouldn't know how my nutritional profile was doing, because LAZY! Now that I know what my blood work looks like.. I can take my time, schedule my yearly doctor's visit with patience, and not feel rushed to get it done. So, if you've been vegan for a while now, and are interested in seeing how YOUR nutritional profile looks like, and HealthLabs sounds like something you're interested in trying - then I've got this code for you for 25% off your first test. Woop! HealthLabs.com - Receive 25% off all vegan testing when using the coupon code SPROUTINGZEN. In order to redeem code - please call 1-800-579-3914. If you have any questions about how my experience went feel free to ask them below, and if you still have some more questions related to how HealthLabs.com works feel free to check out their frequently asked questions page which is loaded with good information. Want to read more about health and wellness? Check out this article on How To Go Plant Based Vegan While Keeping Your Zen, or check out this one to learn about the Benefits Of Juicing. Disclaimer - As always, none of the information found on this site should be taken as medical advice. This is only my experience using this service or product and I am sharing it with you for entertainment purposes. You can read more about our disclaimers on this page.